Application of terrestrial laser scanning in architecture is rather effective due to the high accuracy, speed of measurement ans lack of detail due to the human factor. 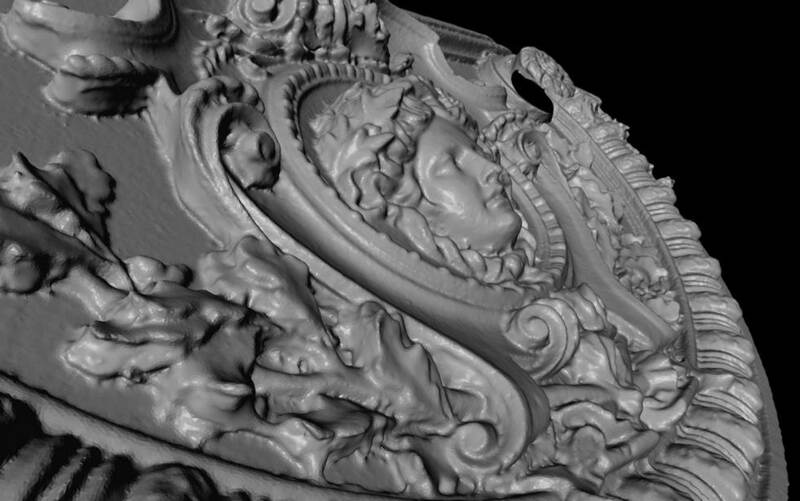 Historically, 3D laser scanning (or high-definition surveying) has been used for architectural measurements of heritage-listed buildings and for surveying for the installation of facade systems. Last years due to the increasing popularity of BIM (Building Information Modeling) approach, laser scanning is incresingly used to provide BIM-designers with a necessary spatial data. Here you can find description of different applications of laser scanning in architecture and restoration. 3D laser scanning is used on the stage of inspection (survey) of an architectural object. The result of laser scanning of a building is flat two-dimensional drawings (plans, facades, slices, details) as well as 3D-model. Laser scanning requires no scaffoldings comparing with the manual method. 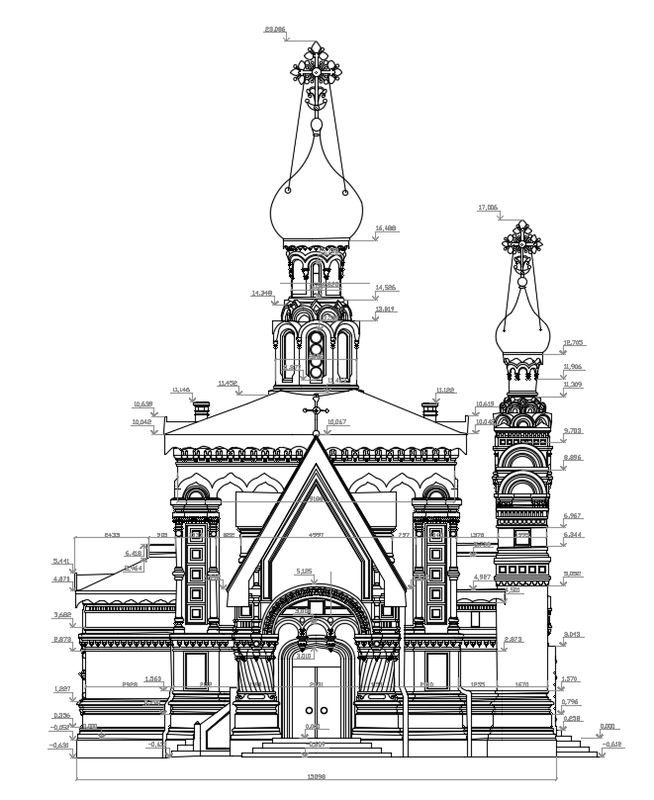 Architectural drawings are then much more precise since the human factor is minimized. Photogrammetric method that is used special devices – phototheodolites, deprived of a great number of disadvantages. But phototheodolites havetheir own drawbacks, the main of which – the restriction to measure the third position. Often architectural measurement perfored by total stations. It is a good way but not for complex or heritage buildings. It is very hard or even impossible to survey reliefs and stucco by total station. A total station performs a single measurement in a few seconds, 3D laser scanner provides hundreds of thousands of accurate measurements per second in the absence of operator. When you use laser scanning in architecture, your field stage reduces at times, you do not need outdoor light and you can carry out a survey in the dark. Another important advantage is the initial three-dimensionality of the data, which can be freely downloaded in modern CAD software such as Autodesk AutoCAD or Revit. Redundancy results of point cloud allow you to measure an object only once, whithout any additional measurements – you always have a virtual copy of a real object on your laptop. To create a layout for a reconstruction or restoration. In this case laser scanning is used to survey existing building. Then design in BIM software like Autodesk Revit is carrying out based on these data (point cloud or 3D-model). To control construction and installation work. In this case survey team makes a promt 3D scanning of a construction site at a specified interval of time, e.g once a month. According to point cloud it is easy to identify errors of construction and erection at the initial stage of a work, adjust a time schedule and save a budget. BIM supports joint work on the architetural design of various specialists: engineers, architects, managers. There is a wonderful opprtunity to present a point cloudin the form of spherical panoramas (Leica Truview or FARO Webshare). With use of this kind of service one can take measurements, leave annotations and what is most important – the object is visible, understandable and accessiblethrough the web-browser. For mounting ventilated facade you must first measure the existing building. Laser scanning is perfectly suited for this task. There is one advantage, among the speed and accuracy, it is three-dimensionality of the captured data. 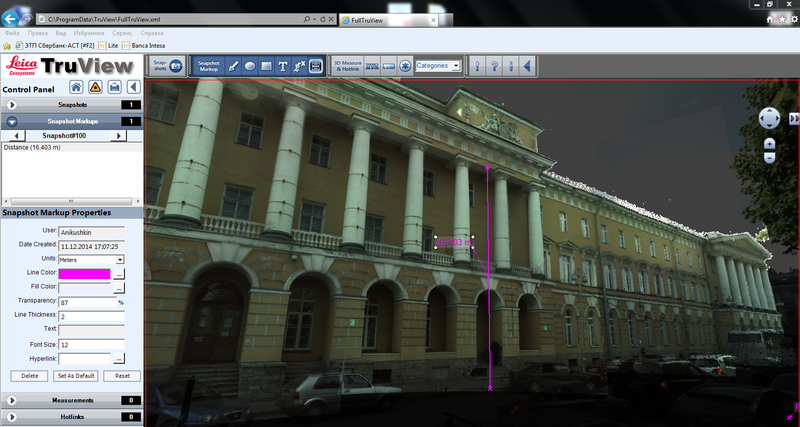 With use of 3D point cloud it is possible to specify not onnly dimensions of windows, columns and other objects but also the deviation from a vertical plane. Virtual tour or an interactive 3D-application is a software, that immerses a user into a virtual reality (VR). VR can be created on the basis of architectural drawings of a real object or on the basiis of design of projected building or site. 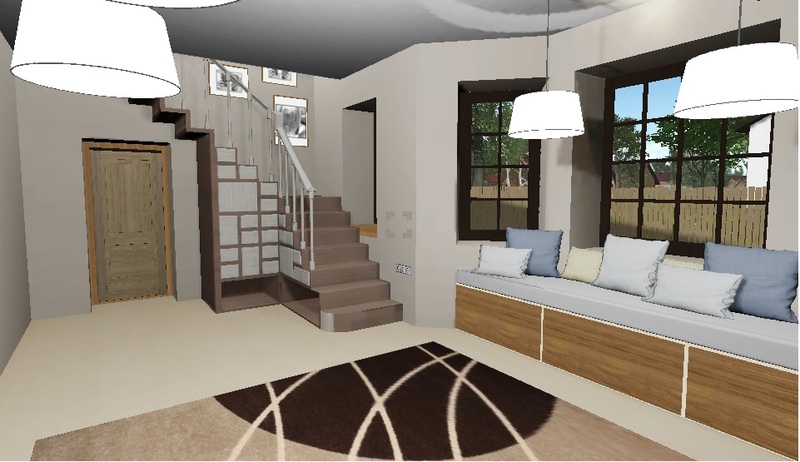 The main objective of the virtual tour – visualization of existing, being restored or designed object in different states and different design options. The object in this case is a cottage settlement, multi-storey building, a listed building, a villa with the surrounding landscape, urban district or a city. On the ares of virtual reality you are given complete freedom of action: to walk, to fly or to examine an object, e.g. interior of a building, a landscape. You can estimate window view, estimate how a designed building looks in urban environment. 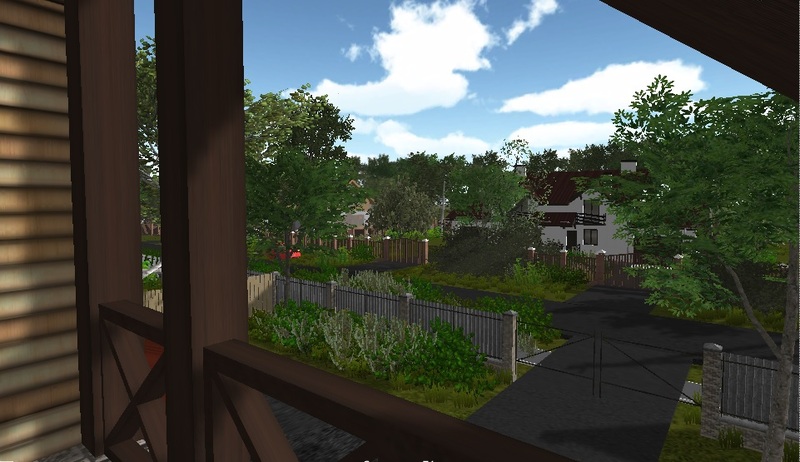 You can even obtain information about properties of an objects inside virtual scene, control the wheather, time of year and time of day. Interactive application allows you to go to a balcony and estimate a view. High realism, achived by detailed textures, light and shadows rendering, the sound (e.g. birdsong, a sound of surf or a motorway). It is possible to use animated objects like cars, pedestrians, animals. Each object from an interactive 3D-application corresponds to the attribute information from a database, a user can receive or edit this info directly in a virtual scene. Regardless of the type of deliverables our experts are ready to provide you support and necessary information to carry out your work in time and with excellent quality. Please contact us using Contacts page.